RESTORE+ organized a workshop to consult relevant stakeholders on planned approaches to assess landscape restoration options that will generate spatial data and quantitative information for policy makers. 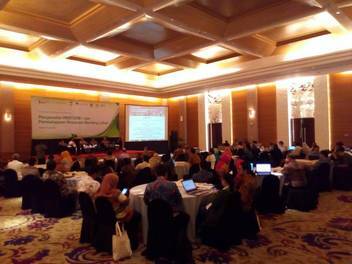 The event aimed at building common understanding on sustainable landscape restoration planning in Indonesia and seeked synergy between the RESTORE+ project with similar on-going or planned projects. During the UN Climate Change Conference (COP23) in Bonn, RESTORE+ reported to Indonesia's Minister of National Development Planning (Bappenas) on its plans and approaches in supporting the formulation the next National Medium-Term Economic Development Plan (RPJMN) 2020-2024. On 13 and 14 September 2017, Brazil’s RESTORE+ team held a series of technical meetings with representatives of Brazil’s Ministry of Environment (MMA), Ministry of Science, Technology, Innovation and Communications (MCTIC), and of WWF-Brazil. RESTORE+ aims to inform key policies in Indonesia by identifying specific degraded areas with accompanying scenarios for restoration and sustainable utilization. To this end, working together with policy makers is required to ensure relevance and to better position the project in informing national policies such as the National Medium-Term Economic Development Plan (RPJMN) 2020-2024. IIASA together with Indonesia’s Ministry of National Development Planning (Bappenas), WRI Indonesia and ICRAF hosted the RESTORE+ project launch to stakeholders in Indonesia. The event puts emphasis on the synergy between RESTORE+ project activities with the formulation of Indonesia’s next National Medium‐Term Economic Development Plan (RPJMN) 2020-2024. 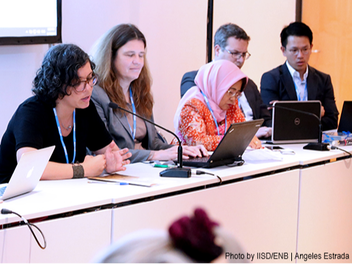 The International Union for Conservation of Nature (IUCN) and IIASA's Ecosystems Services and Management Program (ESM) co-hosted an event at the Bonn Climate Change Conference - May 2017. RESTORE+ was presented in the context of demonstrating the contribution of Forest Landscape Restoration (FLR) approaches to the achievement of Nationally Determined Contributions (NDCs). The Bonn Challenge is a global effort to bring 150 million hectares of degraded and deforested land into restoration by 2020 and 350 million hectares by 2010. This initiative underpined Forest Landscape Restoration (FLR) to restore degraded land to its ecological functionality as well as enhancing human well-being. IIASA hosted the Kick-Off workshop of the RESTORE+ project to introduce the project approach, the planned activities and expected results. Project partners, government representatives and funding agencies came together to discuss concerns over restoration of degraded land and feedback on planned activities and the work plan.